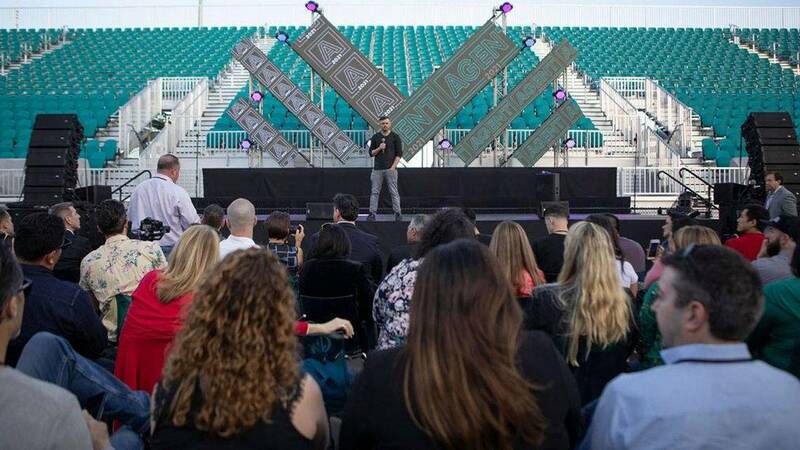 MIAMI GARDENS, Fla. - Gary Vaynerchuk, the chairman of media company Vayner X, held the second annual Agent2021, a one-day conference on social media marketing for people in the real esate, auto, insurance and mortgage industries, on Thursday at the Hard Rock Stadium in Miami Gardens. Vaynerchuk, a Manhattan-based Belarusian-American entrepreneur and famed oenophile, has developed a reputation as a social media marketing guru with his #AskGaryVee podcast. The staff from his digital agency VaynerMedia organized training focused on each of the industries. For Blake Haggett and for most of the attendees, the annual event was an opportunity to learn and network from "the best in the game." Personality-driven marketing has become essential for success in those industries, and with the everchanging digital world many are seeking help from marketing strategists. The audience gave Vaynerchuk, 43, a rockstar welcome. "You are not going to be able to continue to just beat your competitors by going to run Facebook ads. People will catch up over the next two or three years," Vaynerchuk said during his speech, adding that those who have a higher quantity of good quality posts will be at an advantage. The organizers presented a long list of industry leaders including Shark Tank's Matt Higgins, a John Henry, a venture partner of Harlem Capital Partners, Tannis McKenna of Google and Lisa Fong of Pinterest. During his speech, Henry said it's important to focus on telling a story to connect with others on social media. There were Instagram and Facebook workshops on how to best use the tools to do just that. For instance, Instagram allows users to customize a selfie as a sticker when telling stories. For Preston Schmidli, a digital marketing specialist from Tacoma, sharing his knowlege is a personal obligation and the event was an opportunity to make a sales pitch. "The market is filled with one dimensional advice about how to get rich quick with leads, but it's so much more than that," Schmidli wrote. "We are on a mission to provide as much life-changing help as we can to insurance agents and mortgage professionals that want to level up their business and are willing to invest to make it happen." There were also speakers who were locals. Douglas A. Jones, a managing partner with the Coral Gables-based JAG Insurance Group, said that when it comes to developing a personal brand it's important to remember that social media is like a magnifying glass. Honesty and integrity have never been more important. "You just have to keep it real," Jones said. "With the smart phone and the internet, you can't fake the funk. They are going to find out who you are." I am ready to implement what I learned at #agent2021! - I am so grateful for this opportunity. We have so many new takeaways that we will be bringing back to our team and all of the #hyperfastagents. @garyvee was outstanding, and he remembered meeting us in August. I was so honored when he said that we were one of his "least surprising success stories." - Keep on the lookout for more content from agent2021. There was so much useful information we can't wait to share it! "Social 101: The State of Consumer Attention in 2019"
This topic is the LIFELINE to any business. It analyzes efforts to achieve the best business results.